My last (current) one is a 6s+. I’ve developed and sold an iOS app, and can program in Objective C and Swift. I also have three Mac computers and an older iPad that I still use as an e-reader. Seriously, WTF? Note how the Google web app is rock-solid, but the Apple desktop app is acting like some flaky web app. That was the day I switched to using Google Photos exclusively. So to be fair, I wasn’t 100% in the Apple ecosystem. More like 80%. I’ve got several Linux boxes around because every so often, my Macs just… have issues. 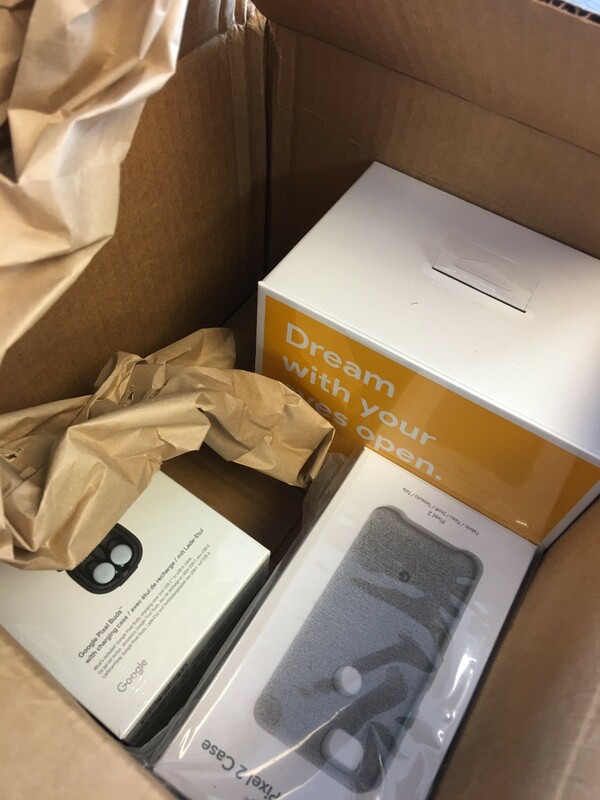 That’s what it looks like when you order a phone and accessories from Google: pretty nice. Not a ton of padding in the box, but enough. I was wondering how it’d all arrive. What you see there is the phone, a case, the special bluetooth/assistance earphones, and the VR thing. 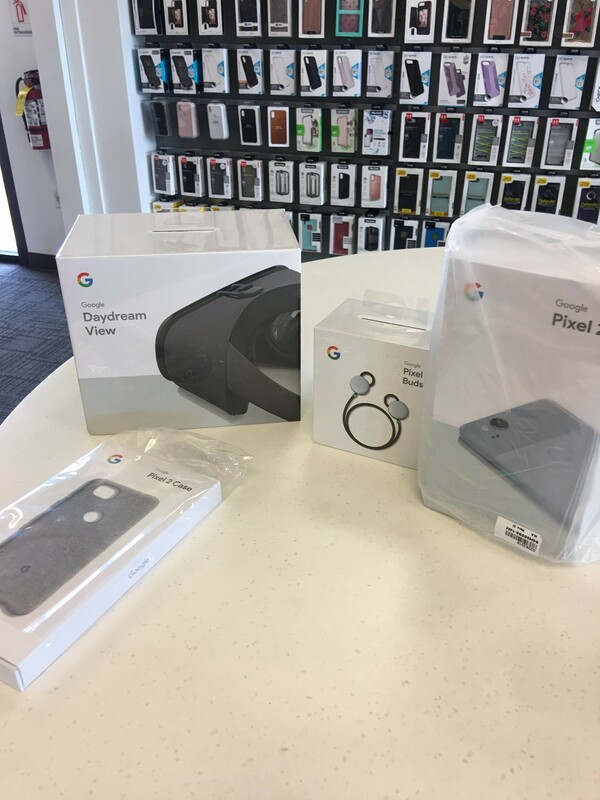 If you get the Google 0% financing, you get 0% on everything you buy at the same time as the phone. So yeah, I loaded up; I wanted the full experience. I took those pictures in an AT&T store. AT&T doesn’t sell the Google phones, but they list them as compatible. 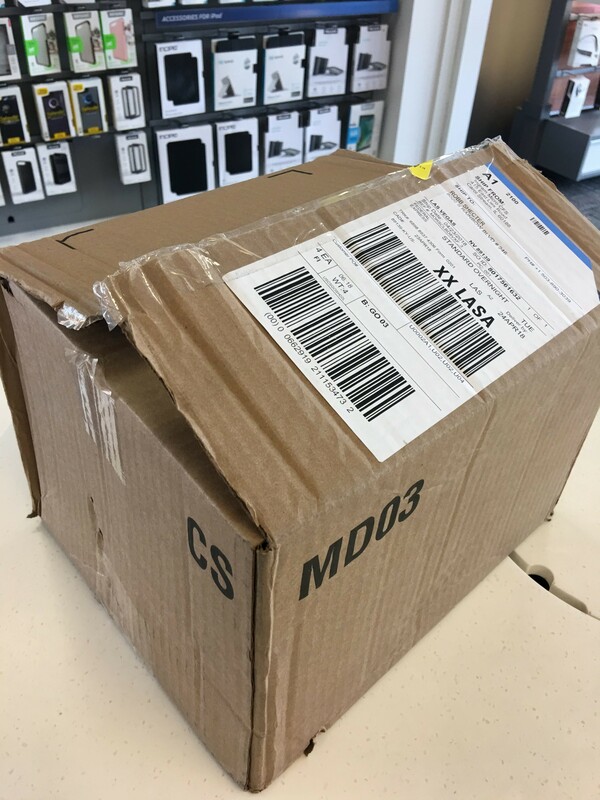 * So I ordered mine unlocked, and opened the thing up right there in the store. It took them about ten minutes to remove the SIM card from my iPhone, place it in the Pixel, and activate it. * The only change I needed to make started off as a puzzler: At first I was back to 90’s-era dial-in voicemail. It seems that I needed to download AT&T’s “Visual Voicemail” app. At least, that worked for me. Makes sense, I thought: normally, these apps (and other “bloatware”) are pre-installed on phones when you buy them from a carrier. It turns out, according to AT&T chat support, that they do not yet “support” visual voicemail yet on the Pixel 2. (!) Vaguely thinking about switching carriers. The design of this case and the earbuds is impressive. Note the small green LED; it lights briefly when opening the lid, displaying their charge status. The cord is the perfect length to wrap around and tuck away, exactly like the helpful sticker shows. The clamshell design stays closed magnetically. 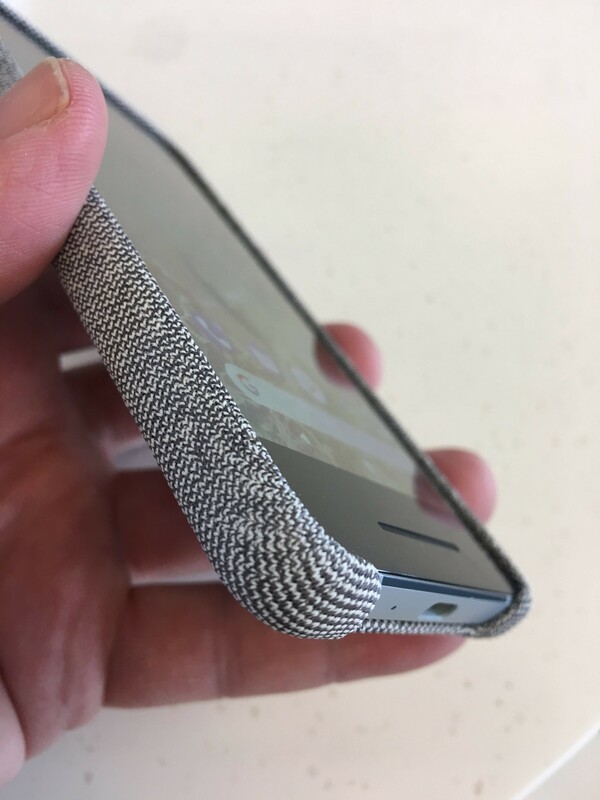 And even though it’s very light, it feels strong — like it can definitely protect the earbuds when thrown around in my messenger bag. 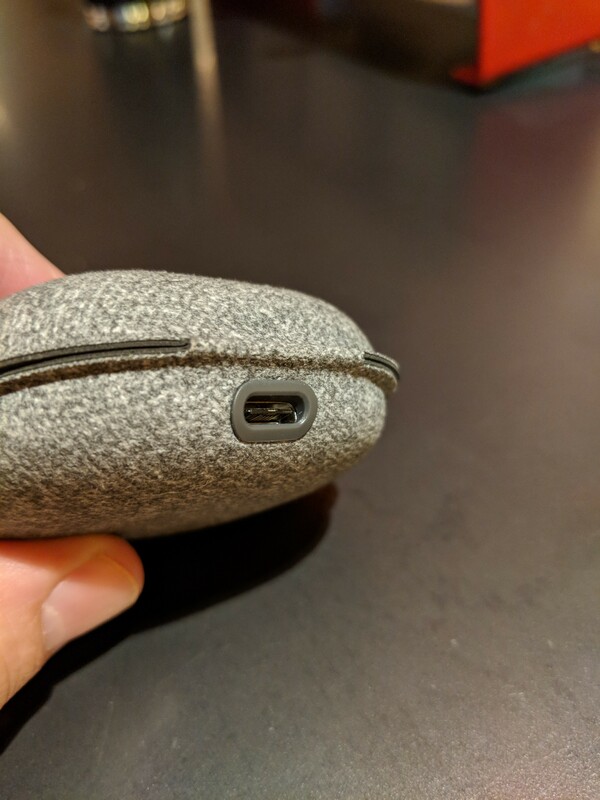 That’s a USB-C connector, by the way; same as the phone. Not sure yet how I feel about that vs. the Lightning connector on the iPhones. I like having a standardized port, though. The experience of installing apps is far better: browsing, purchasing, and installing apps from the phone or a desktop browser at play.google.com. Better user experience, and much faster than the iTunes app. 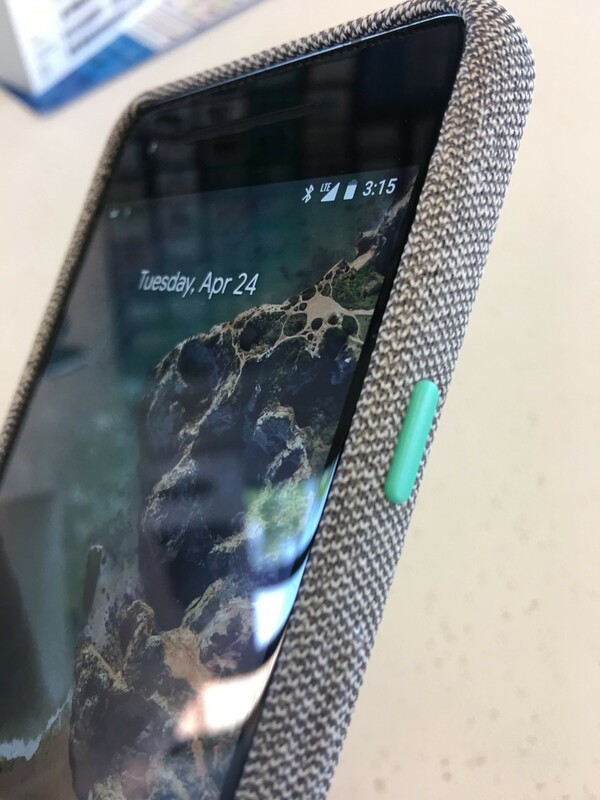 Location of the fingerprint reader is on the back of the phone, and it’s brilliant. My fingers are already there, and it’s much more natural to unlock the phone. The mini-icon line-up at the top of the screen and the lock screen shows the kinds of notifications waiting. Very handy. There’s a super-easy clear all link which is fantastic and hits at my #1 pet peeve w/ iOS’s design: the iOS notifications give me more work to do, not less: Pulling them up, deleting, tapping, swiping, etc. My iPhone (and Messages) have a long trail of outdated objects I refuse to clear off. I’m also getting more kinds of notifications, and for more high-level, interesting things. Always-on OLED in lock mode ties in to the notifications, displaying mini-icons and a couple of pieces of important info. Universal back function: It’s great having a global “affordance” for the super-common thing that people want to do. It works well, too: its meaning subtly changing in the right way, depending what you’re going back from. Cases which completely match the phone’s colors, down to the aqua on/off button. Much more transparency about what the phone is doing: how it’s charging, what it’s downloading, etc. Elegant solution to the hunting-wifi problem: when out of the house and switching off the wifi, it has a mode where it’ll switch it on when back home. This was always super-annoying with iPhones, and never found anyone who understood it. Automatic wifi control and notifications work together to create a great user experience. I feel simultaneously taken care-of, and still fully in control of the device. That sums up the Pixel 2 experience, I think. No force-touch makes everything much simpler: Just short presses and long presses. Maybe I’m in the minority, but I could never remember, for each app, whether to use force touch with it and when. I’m much quicker now on the Pixel 2 e.g. accessing context menus. Search/App suggestions that really work: in comparison, the latest iOS versions have broken Siri and app search in certain settings and situations. I can place icons where ever I want. I always understood and respected why Apple locks down the phones so much. But they take it way too far. I feel like the Android puts me back in control. “AR Stickers” are cute and maybe I’ll use them once in a while. I think this is from Star Wars? That bird-thing PORG on the left is an “AR Sticker”. Everything else was actually there in the room when I took the picture. Smart Lock: is a fantastic idea. The phone can stay unlocked in a number of situations. E.g., when I’m still at home, or I’m using the earbuds. 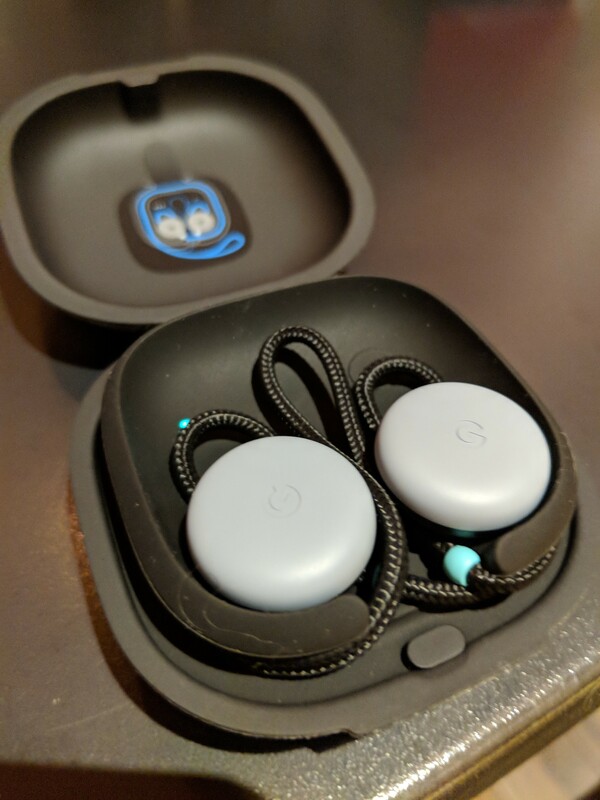 Google assistant, in the earbuds is amazing, and just generally great. Reading a text message to me, letting me reply verbally, and then I dictate to it, and it sends the response. Walking me through how to do it. All the sounds are better than iOS’s. I never could find a non-jarring iPhone alarm tone. The Pixel 2’s default, “Bright Morning”, is fantastic. The default ring tone is likely superb. This surprised me to be honest. I wasn’t looking for this kind of feature, but I truly appreciate the well designed sound scape. Visual Voicemail isn’t seamlessly integrated with the phone app, like it is on the iPhone. It’s possible I haven’t set it up correctly. It’s not a tremendous issue, because AT&T’s voicemail app creates quick appropriate deep-linked notifications when I get a message. UPDATE: This definitely seems to be an AT&T issue with the Google phones. Notes for quick & temporary docs, like copy & pasting something from the Mac and being able to pull it up on the phone. Must switch manually from bluetooth headphones to bluetooth in my 2013 Subaru. iPhone did that automatically. (Or was that a bug?) When I’d start up the car, the iPhone connects, and the sound switches from the headphones to the car audio. But: the Pixel 2 works fine in “podcast player” mode, whereas my iPhone doesn’t. Maybe this sounds naive, but I’m completely surprised by how the product stands on its own. It’s not in the shadow of iOS, not playing catch-up with Apple. I’m continuously seeing common problems solved in new ways. In contrast, Apple gives me the impression of running on fumes. The devices no longer “simply work”, at least for me. Much of the iOS experience is knowing which things to shut off, and which things to work around. Try Google tasks or Google Keep for reminders. 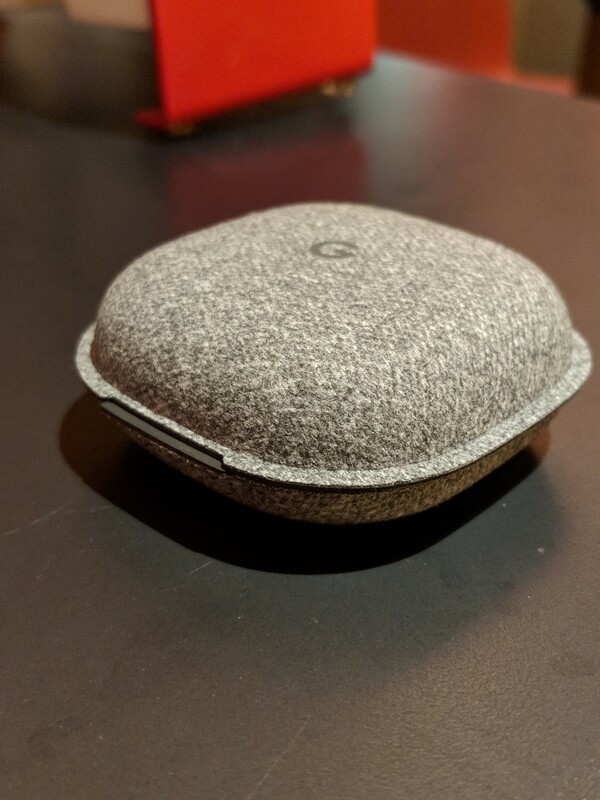 I would also recommend getting a chromecast and google home to really appreciate the whole Google ecosystem. Thanks! I’ll give it a shot. Yeah, I’m very intrigued by the apple-tv-esque ability to send A/V to a screen. Second this. Pocket casts is amazing. There’s even a paid website that syncs with your phone. I switched for a Xiaomi A1. It costs far less and provides quite a nice experience compared to the iPhone 6 I still own. Android auto is a better experience than carplay. However I was used to adblocking and honestly I was quite shocked by the amount of abusive advertising in the apps and mainly in chrome. Let’s not forget that is the bread and butter of Google. Blokada is quite interesting for blocking ads and fennec droid basically allows you to install much of the browser add ons from the Firefox store. My minor complaint however is quite similar politics of the app store. Using non-officially android auto add it is not present in my country. I definitely miss Android’s notification system on iOS. I wish Apple would improve in this direction. Something that I found out recently is that you can clear all notifications on iOS, by force-pressing on the X next to today in the notification pull down. While i’m in no position to comment on the quality of modern Android systems (last and only Android phone was the Nexus One), i really dislike the fact that i cannot use the phone without giving Google even more information on me. On the iPhone, things might be perceived to be of a lower quality, i.e. frequently visited places, but these places stay on the phone they’re recorded on, and even if you restore a backup to another phone, they don’t migrate to the new phone. Most “AI” stuff Apple is doing is done right there on the phone, where most “AI” stuff google does takes a roundtrip to their servers. Things like iMessage uses end-to-end encryption, and each iOS/Mac device uses a GPG key that is unique to that device. Each message sent is actually encrypted and sent in n copies, one for each device key. Apple has spent a great deal of time ensuring people that this cannot be decrypted, and they’re partially right, as they control the keyserver, and can (potentially) inject a new key – representing a new device – to obtain copies of all new messages, which could potentially allow law enforcement to obtain copies of messages. Google recently introduced their newest messaging service, and no, there’s no end-to-end encryption. Apple, being primarily a hardware vendor, can afford to take a stance on privacy, where Google would go bankrupt if they did the same. Excellent points – thanks! I guess that two things have given me confidence about Google’s privacy and security: First, my experience with Chromebooks. Nicely secure. Secondly, I’m not using Google for free; I’m paying for their business account, and I see them as any other SaaS provider. And compared to any other, their security is amazing. I have no doubt, from an attackers point of view, that Google has really good security, but with the latest Facebook “leak” clear in my memory, i’m trying to limit the amount of information i give about myself, while at the same time trying to live in 2018. When Snowden revealed how the NSA was operating, i removed any “cloud” presence i had, and replaced it with machines/services where i’m in control of what’s being stored where. Any data that leaves my machines is source encrypted, and i don’t use Dropbox/Google Drive/whatever. My last remaining hurdle is GMail, or the Google Apps specific version of it to be exact. I host 5 domains or so on Google Apps, and any relatively sane option is very expensive ($5-$10/month/user) for more than 1 domain. I did run my own mailserver for close to a decade, and while it doesn’t exactly scare me, i don’t feel i need the added workload of keeping my server off of various block lists. Ultimately i decided to stay with Google for mail, as all email has at least 2 parties, and with something like 50% of the worlds population using GMail, there’s a really good chance any email i send will end up in a shadow profile at Google anyway. What!? There is! AOSP (Android Open Source Project) is Android, but without any Google apps. Google takes AOSP, adds ringtones/themes/etc… and their Google Apps and ships it to Pixels. I am running my phone without Google Apps, only using F-Droid. What!? AOSP (Android Open Source Project) is Android without Google Apps. Google puts their ringtones/theme/launcher/etc… and Google Apps on AOSP and ships that to the Pixel. I am using my Android phone without Google Play services. Highly recommend Pocket Casts. No free version, but it’s cheap enough, handles either downloading or streaming podcasts very well, and it’s beautiful and simple to use. Weird at times, but it works. One of the main reasons for me to stay invested in the Apple Ecosystem is how everything works well together (Handoff, iCloud Sync, AirPods pairing, Apple TV remote widget, etc. just to name a few). → What is your experience so far with integrating the Pixel into your everyday workflow, is there non-hacky ways to sync data back and forth between at least Mac and Android? … the iOS experience was more “complete” to me. → Is that still the case? Or do you feel like the Android apps you use can hold up with their iOS counterparts? Passwords and private documents with 1password syncing. the 1password app is great so far. Dropbox and Google Drive for all my files. These still work great on the Android. iCloud for my Mac Desktop … no change there, and I never accessed that from the iPhone. The ONE area I’m lacking is the Apple Notes app: I’m used to being able to copy&paste whatever junk into Notes on the Mac, and then easily pulling it up on the iPhone. So I’ll need to switch to something else. The killer app for the assistant, at least so far, are the reminders. Instead of tapping around you just say it or type in natural language. I’ve never been able to use any reminder apps before, but the assistant one fit very naturally in my flow. I would love to make the switch, and with all the great Android phones lately like the S9 and Pixels, but I am so entrapped by Apple with my recent purchase of an Apple Watch, iMessage, and all the other Apple-only functionality inside the walled garden. They are honestly making it harder and harder to be multi-platform, which I know is their intent. It works. How did you deal with leaving behind some of the Apple-only features like iMessage or using an Apple Watch? You may want to try Google Voice for your voice mail. It transcribes message also lets you choose additional ways to notify you of voice mails. Definitely not prefect but better than your current option. A quick web search will teach you how to set it up. Also coming from IOS I think you might like Nova Launcher with Sesame shortcuts and Google Now integration. The search behaves a little bit more like spotlight. Podcast Addict for Podcasts and use google calendar for reminders. Hi Robb. Good write-up. I too switched to Android after 10 years on iOS. I have two posts that you may find worth looking at, my review of Google Pixel 2 XL and my daily Android apps after using the Pixel for a few months. All the best on this new frontier! The articles look great! Thanks for sharing. I think that may be related to your provider (if you’re referring to voicemail transcription). I’m on Google Fi and it works flawlessly. I actually carry an iPhone 8 and various Android devices since I have 2 lines. Up until last year I all Android but since rooting and custom ROMS is really not worth it now I tried an iPhone and love some parts of it. I’ve also owned and returned both models of the new Pixel because they both had issues and am currently waiting for the OP6. To me I think Android’s customization ability is it’s strong suit. Apple has an edge in the app quality and iMessage. I have Gmail set up on both phones (and I mean I’ve had well over 10 Android devices in the last year) and email (Gmail) will always arrive first on IOS. Sometimes by 1 second, other time over 30 seconds. But end of the day carry whichever you like (or both like me) as neither platform is perfect. Interesting – where do you actually receive / view the transcription? In which app? It just shows up under the voicemail “tab” in the phone app. They show up under the voicemail “tab” in the phone app. Hey, I wanted to include a visual for the visual voicemail as seen on T-mobile. I hope I can post links. Excellent – thanks! Yep, I don’t have that fourth tab for voicemail. 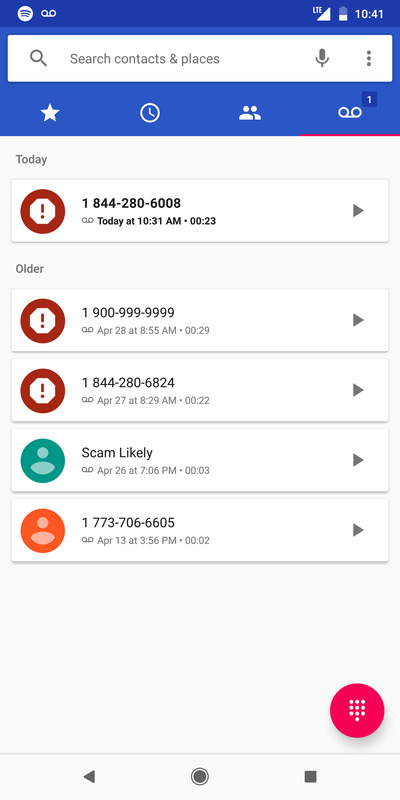 An AT&T support person said that they don’t yet support visual voicemail on the Pixel 2. Ha! I knew someone would tell me what that is. I guessed it’d be from Star Wars — that seems to be the default set of stickers. I really had no idea what I was looking at. If you’ve made the move you can also switch to Google Fi. I spend less than half what I did on AT&T and have better coverage. Fi is really intriguing. So, if I understand it right, the Pixel 2 has built-in support for it. And Fi works as a sort of layer over several carriers. Switching between them seamlessly. Seems to be pretty much the non-AT&T carriers. Non-AT&T or Verizon. It will also do VoIP calling, and integrates seamlessly with a Google Home device. Simply saying “Hey Google, call Bob” will use your Google Contacts and call on the Google Home device with your Google Fi phone number, so “Bob” won’t be chased off by “Unknown Number” showing up on his caller ID. You also only pay for the data that you use. In my case, since I’m practically bathing in WiFi, my phone bill is pretty low. My wife and I combined with calls and data runs between $50 and $60 a month. You can also answer calls from any other device you own, like your computer, through Google Hangouts. I’ve been on Fi now for over 2 years, and I love it. Surprised you didn’t mention anything about the camera. It is amazing! Join by Joaapps is great for moving things across devices and getting notification across devices. You cannuse the chrome desktop browser extension. You can send receive your clipboard, files, send/receive calls and texts on devices other than your phone but they are from your phone. There is also a windows app and a webapp for browser other than chrome. You get a two week trial. Thennit is cheap for an app that does so many useful things. 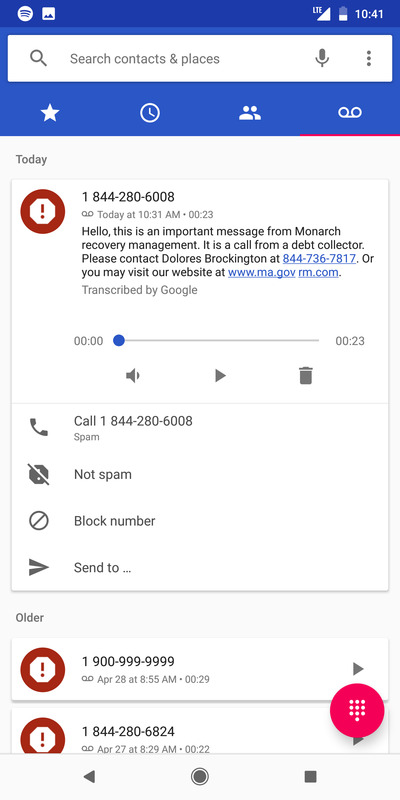 And if you the latest version of the google dialer app v19.0.x.x.x.x there is visual voicemail as in a gui, and there is also voicemail transcription. Open Phone Dialer – menu – settings – voicemail …. Try Flowx if you’re interested in weather. It is different from your usual weather app. I made it so feel free to email feedback. I also use PocketCast and highly recommend it. Thanks for sharing all of this, without any rant or fanboy excess! Unfortunately, Google got careless with the regular updates to the Pixel phones. On the Pixel 2 and XL, back in February, they introduced an interop problem with the wifi access points on a variety of home broadband routers, including those from some of the biggest ISPs here in the UK. The problem causes data stalls even though the status icon for wifi shows it connected with good signal strength. It’s been months (with their further monthly updates) and this still isn’t fixed. See https://issuetracker.google.com/issues/73336431 for lots of people with the issue. Regular updates are great until they break something fundamental. Google’s support is non-existent, alas. That’s really interesting, thanks for the link. One major minus of the Pixel is that it doesn’t have a pen like the LG Stylo 3. That comes in VERY handy.